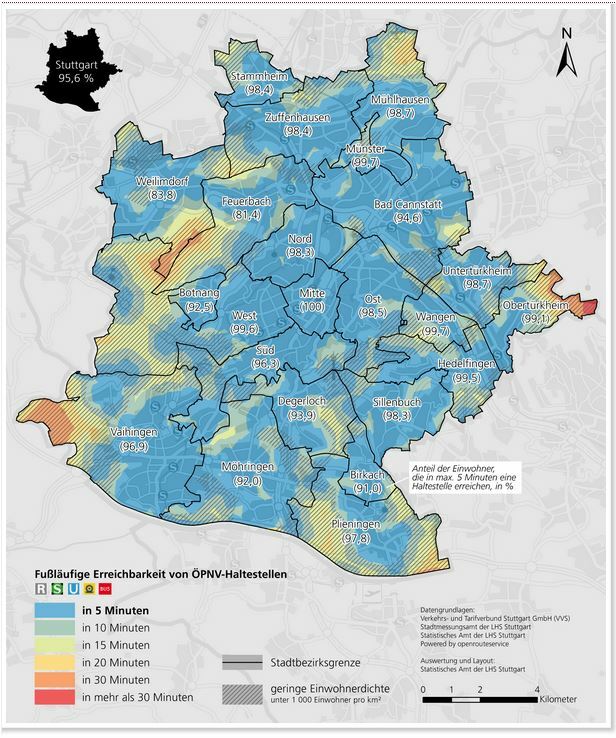 The Statistical Office of the City of Stuttgart determined the walking time to the nearest public transport stop for every place in the city using our QGIS plugin OSM Tools. With OSM Tools it only takes a few mouse clicks to access most of the functions of the openrouteservice. The toolset includes routing, isochrones and matrix calculations, either interactive in the map canvas or from point files. As a result, it is stated that Stuttgart has a well-developed network of public transport stops. Almost all citizens reach from their place of residence on foot in no more than 5 minutes a stop. Deficits exist only in some outlying districts with low population density. Details can be found on the maps in the publication. The research has shown that the combination of municipal data with freely available data and their analysis with open software leads to vivid and usable results. A routing-based accessibility analysis based on isochrones can map the reality much more accurately compared to simple air-line calculations. Fabian Schütt: Erreichbarkeitsanalyse von Haltestellen des öffentlichen Personennahverkehrs. Statistik und Informationsmanagement Monatsheft 12/2018. 77. Jahrgang Herausgeberin: Landeshauptstadt Stuttgart. S. 328-333.